When is my Cake Day? Though above function will work, but soon it will start throwing HTTP 429 error i.e Too Many Requests. Thing is, Reddit doesn't really like when someone tries to fetch the data like this. The requests are made directly on Reddit servers without using the API. 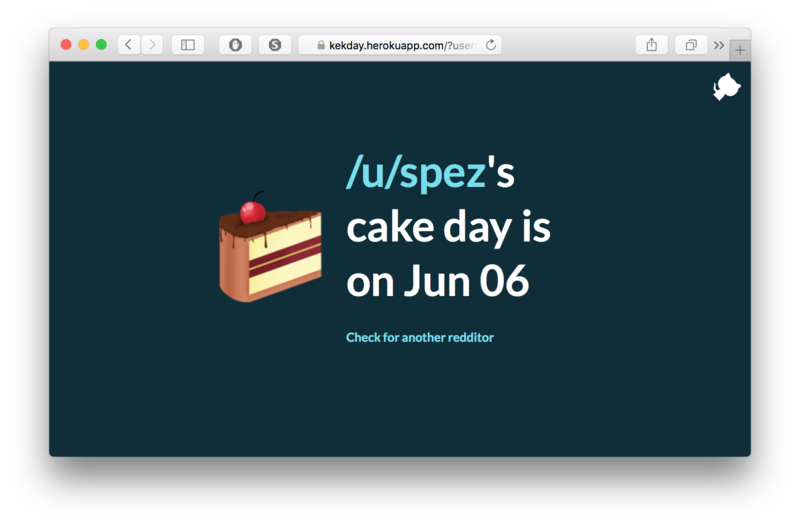 Now if you have want to find cake day of hundreds of users, you cannot use this method. Solution? Use Reddit's API. In Python, we will use praw and prawoauth2. praw is a Python wrapper for Reddit's API and prawoauth2 helps dealing with OAuth2. This is better compared to earlier version and we will stop getting rate limit errors often. Also, praw will handle such cases and makes requests again to fetch the data. But what if we want to increase the limit? Follow the simple steps here to register your app on Reddit. Once done, you will get app_token and app_secret. Then you need to get access_token and refresh_token. You could use this handy onetime.py script. For detailed instructions check the documentation of prawoauth2. You should never make app_token, app_secret, access_token and refresh_token public and never commit them to version control. Keep them always secret. Again, pretty much self explanatory. If your tokens are correct and once PrawOAuth2Mini is initialized properly, there will be no issues with the app and you will have twice as many requests as compared to unauthenticated version. Want to see above app in action? Check this - kekday. The app is open source and released under MIT License. © blag powered by pelican with skyfall theme.